Cannot run paint.net installer inside Sandboxie... Error. I'm clearly on Window 10, fully updated as of today, and use latest Sandboxie version (stable). Re: Cannot run paint.net installer inside Sandboxie... Error. To add to this, it wont even run Paint.NET, gives the same error, Paint.NET.4.0.19 worked just fine. Maybe this is related to the following change in version 4.0.20? Is your installed .NET Framework version 4.7? Edit: I see you are using Windows 10. The .NET Framework should be up to date then! 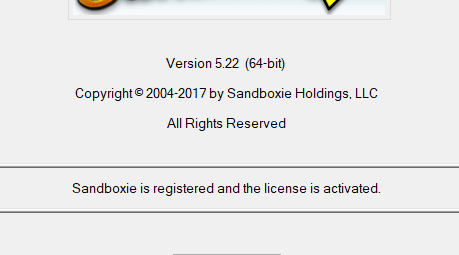 I can confirm the issue, version 4.0.20 won't run sandboxed and shows the message always. Yeah as you can tell, I'm on Windows 10 so .NET should not be the issue, the installer and Paint.NET it self run fine outside of Sandboxie, and previous versions also ran fine inside Sandboxie, just not this version. I can repro the issue and, so far, haven't found a workaround other than installing it on the host and running it Sandboxed. I'll update this thread if anything new comes up. With version 4.0.19 were you able to copy-paste or use the line tools in the sandboxed paint.net? On W7 that results in a crash, as documented here in this two and a half year old problem report. Wonder if it's different on W10. Not sure about copy/paste but everything as far as I know worked well on 4.0.19 in sandboxie, I've never had it crash on me and I used the thing for hours at a time, probably a hundred hours or so just on that version. Any update to this yet? Have you found the cause, can we expect a fix in the next version, etc. If any new info comes up / a fix is found at some point, we will update this thread. This was fixed with Beta 5.25.4. What the heck, it doesn't work anymore... I was using it all day yesterday in Sandboxie and it worked fine, today I'm getting the same error as the OP. EDIT: So you probably want to edit out that [SOLVED] tag because it's not yet solved. It installs and runs fine outside of Sandboxie, I'm on the most up to date .NET Framework and Windows 10. Has this issue even been looked at? Any reason why the installer thinks I'm not running Windows 10 (version 1607) or greater when I am? However, we do review these problems when possible and look for a fix when feasible, and we update the threads accordingly. We have also provided you with a workaround, is that still working for you, or that's also broken? If the workaround is that I need a VM, well I don't have one, I want to avoid installing anything on my host. 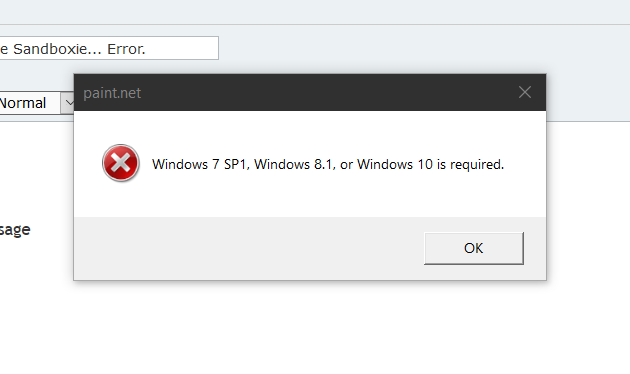 Windows 7 SP1, Windows 8.1, or Windows 10 (version 1607) is required.